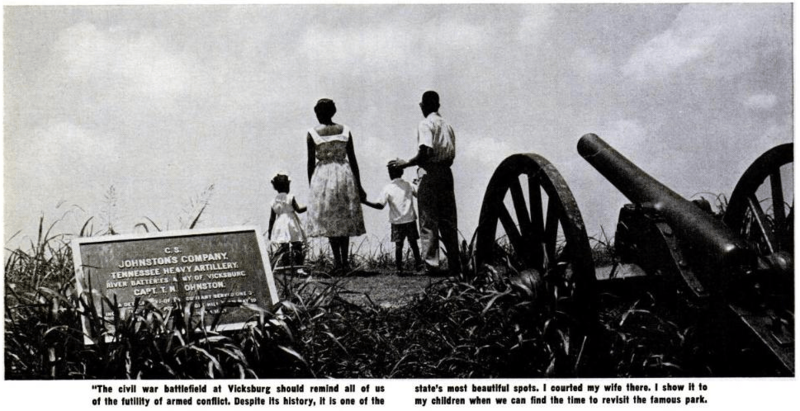 This morning I was perusing through the September 1963 issue of Ebony Magazine and came across this remarkable photograph of Medgar Evers and his family on the Vicksburg battlefield. Apparently, they spent a great deal of time on the battlefield. This particular issue centered on the 100th anniversary of the Emancipation Proclamation, which included a story about Evers on why he chose to live in Mississippi. There’s a sad parallel to this. While 1963 was the centennial of the Emancipation Proclamation, it was also the year in which Medgar Evers was assassinated in his driveway with his wife and children at home. He was dead before the picture was published. Yes, the magazine acknowledges that in a preface to the article. Evers was murdered following JFK’s civil rights speech. Thanks for posting Kevin. Any idea who was the “white man, whose ten gallon hat and deep drawl identify him as one of the “enemy”? Sounds specific. White Citizens Council guy? Governor Ross Barnet? I have no idea. I simply quoted from the magazine article. Too bad – the statement says alot of southern culture – and that was 100 years after the civil war. I always thought Wayne Greenhaw book “Fighting the Devil in Dixie” summarized southern culture well when he said in the intro: “In the aftermath of the federal court’s ruling that ended legal segregated public education, most white adults in my home state of Alabama were silent while a small minority rode nightly, terrorizing black people, bombing houses and churches, castrating and killing. The silent whites simply demanded that their children go to school, come home, and stay out of trouble.” Terrorism was tolerated. It was dangerous for even whites to step forward. Not only was terrorism tolerated, state and local authorities, especially law enforcement, used it to protect Jim Crow. Many Southern state and local police were Klan members and even leaders. In Mississippi, the State Sovereignty Commission was implicated in the planning that led up to the assassination of Goodman, Chaney, and Schwerner in 1964 and it was Mickey Schwerner who was the target of the plot (he drove them senseless: a goateed Jew from the North who was in Mississippi working to register blacks to vote). Read “Unlikely Heroes” about the judges of the Fifth Circuit who issued some of the great civil rights decisions and District Court Judge Frank M. Johnson in Montgomery, AL, who did the same and the retaliation against them (None back down, even though in Judge Johnson’s case he received death threats, a cross was burned on his lawn, and his mother’s house was bombed.). The tipping point finally came when enough people of both races finally said enough. Yes – it was ugly. But it can be argued that Judges like Johnson were only doing their job. He upheld the law – which was putting his life on the line in 1963 Alabama. We should give credit to the Medgar Evers, the preachers like MLK and Shuttlesworth, and all the individuals that risked their lives when they knew if they were murdered, nobody would be held accountable. I am still amazed that the KKK wasn’t successfully prosecuted until they lynched a kid in Mobile in 1981. And in 1981, that news that was burried in the back of the Mobile Register. Not even front page news. It can be argued that, but the fact was that they were rare exceptions among the Southern judiciary of that time. I did not intend to minimize Judge Johnson’s courage or his wisdom in standing up for the right cause. He was a rare exception – I agree. Sadly, he should not have been a rare exception. The Judge lived 80 years, not bad for a wanted man. When Kevin posted this article on Evers in Ebony magazine, I could only think of Evers bravery in knowing he had enemies that wanted him dead – and how interesting it was that this enemy was not mentioned by name. And Evers would never had gotten a body guard no matter how many times his life was threatened. To think so many white southerners accepted this terrorism – and even worse – were proud of it. That was my thought – not to take anything away from Judge Johnston. Thanks for the explanation. I understand your point and it is very well taken. During the search for Goodman, Chaney, and Schwerner, the Goodman and Schwerner families kept making the point that, while they appreciated the support, that they were also sickened and outraged by the knowledge that the case would have never attracted any attention if the missing workers had all been black, especially black Mississippians.